Gorgeous! I want it too! 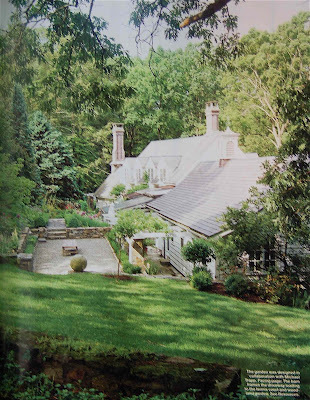 The house is so well sited nestled into that beautiful lush and green landscape. Not entirely certain from the photos, but the house also seems not too big or overly "grand." Refreshingly tasteful. Almost impossible to find something like this in Texas. Well, yes, impossible, because that sort of landscape doesn't exist either. 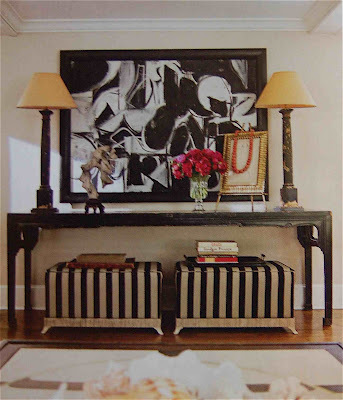 Does every console table now have to have a pair of ottomans or benches under it? Love the home and the garden...sadly my garden slopes AWAY from my home so I'll have to work hard to gain this feeling of privacy. Also, found your blog recently and am continually amused... and amazed at that which can make people crazy. Why does anyone care if YOU choose to let YOUR dog on YOUR sofa? etc., etc., etc. Happy New Year ! Keep it up. Wow Decorno, great post, thanks! I love the beams in the kitchen, and I always enjoy a b&w tile floor. I don't blame you a bit, it's really beautiful. 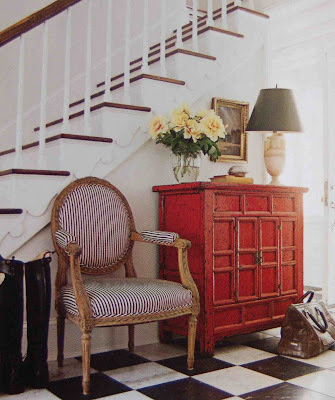 When I saw this photo spread in Elle Decor, I almost passed out. Never has a house been so perfect in my eyes. Every room perfect and the landscape. If I lived there I would cry everyday. Oh, yes, that is a lovely house of the Lambertson Truex's! I like it. I have a page from House Bruuuutiful years passed that was their other cottage. Very approachable, comfy, and all the while swell. This is in the same vein.